Now we are about to create this bottom jumbotron part. 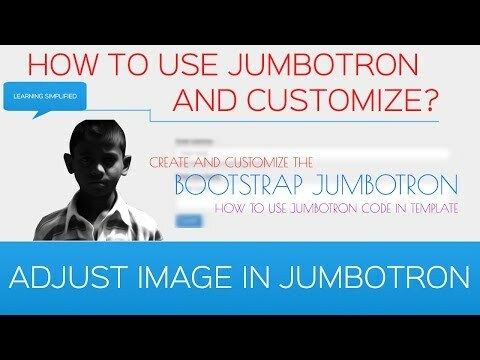 In the previous part we have discussed how to create and customize our own jumbotron. So we won't be repeating that process now. and in the search list it is the third list item. This is the official website of bootstrap responsive framework. Now from here we can see that there are two segments. jumbotron that will be taking a 1200px width. occupying the whole page and it will be having a margin of 15px from both the ends. So instead we will be looking for a jumbotron-fluid and here it is. This is known as the fluid jumbotron and here goes the source code. from both the ends; from left end and from the right end. We are creating another class in this jumbotron, which will be known as 'question'. for say, 0 15px for the time being. Now we need to create all those elements inside those we are seeing over here. Like this image and these text words. be interacting with this website. area field, such the user will be providing here necessary queries. So we'll be creating here a form field instead of this text element. So we have created this Div. Right now what we need to do we need to close that Div. we have created this col-sm-8. So what is the purpose of creating this col-sm? We want our contents to be displayed side-wise in case of a 768px device-width. And that is why we have used here col-sm. to create here an image source. Now this is the folder name, so we need to copy this folder name first. And then we will be needing that filename from here. This is the filename along with its extension name of .png. Getting back to our project and we are using it. So we need to provide here an alt tag with a definite image name here. So we are naming it as ' image11'. So it has been provided. There is a particular padding from the top and from the bottom. So we need to rectify this. First of all press here F12. There goes the padding-top 48px and padding-bottom 48px. And there's another padding element here, from the top and from the bottom. So if we remove all those padding, we can see that this is the result. So we need to overcome the major problems here. and in the second case - the size of this image. Too big to fit into this device display width. So that is what we need to rectify here. If we use a class known as 'img-responsive', there it goes. is now fitting into our device display width. So this is one of the major things that we can overcome. Now if we want to modify this padding, we want to modify it as in here. We can see that there's practically no padding from the top or bottom. here; and on the other hand we have used a 'question' class along with this 'jumbotron-fluid'. thing, it is all experimental, so we are pressing here padding to 0 with this '!important' tag. Press control + s, get back to our project and reload. the image into this display, it is working well. There is absolutely no problem with it.